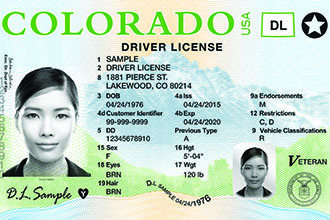 The Colorado Division of Motor Vehicles (DMV) will start a two-week statewide rollout of the newly designed driver licenses, instruction permits and identification cards beginning April 6, 2016. The new design features a more colorful background showcasing Mount Sneffels located between Ouray and Telluride. The State Capital is pictured on the reverse. The card also includes laser engraving of the customer's information and primary photograph in grayscale to enhance the security and safety of the document. The poster attached to this article provides additional detail and samples of the new license.